Peter Morgan hit 14 fours and three sixes. 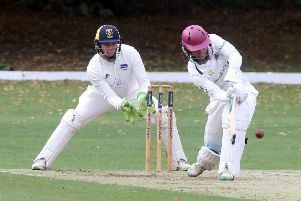 Bourne were certainly in a hurry when they entertained Market Rasen in the Lincs Premier Division yesterday (August 8). They had the visitors all back in the pavilion with just 101 runs on the board and then, thanks to a lusty 80 not out from Pete Morgan, they scorched to 104-0 and it was all over before 4.30pm. Morgan hit 14 fours and three sixes while Tom Dixon was Bourne’s most successful bowler with 5-31 off 9.5 overs. In the other two matches involving local sides there were runs galore - sadly from the opposition. Sleaford rattled up a mighty 355-2 at rock-bottom Spalding with Ian Shorthouse leading the way on 203 not out. Spalding were all out for 88 in reply. At Outgang Road, Grantham batted first and compiled a formidable 293-4 with Karanjit Bansal smashing an unbeaten 169. Market Deeping gained a draw with their 155-8 in response. Opener Chris Jones top scored with 32.